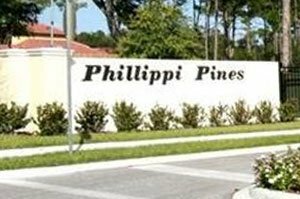 Phillippi Pines is a gated neighborhood in Sarasota Springs, an area that for years has been known for its entry-level housing and later a domain of some popular bedroom communities. One of these lesser-known but equally highly desirable neighborhoods, the age 55-plus condo community of Forest Lakes Village, is located just north of Philippi Pines. A well-established neighborhood of single family homes, Old Forest Lakes, is also adjacent east of this community. Characteristic of most bedroom communities that prospective buyers of Sarasota homes for sale tend to overlook, Phillippi Pines is hidden in a drive-by of the major roads in its locality. Its access point is Sawyer Road, a dead-end street perpendicular south to Bee Ridge Road which could easily be reached west from U.S. 41 and east from Interstate 75. 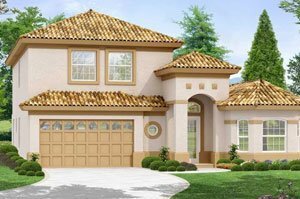 Phillippi Pines is a small but charming community consisting of just 16 single family homes. A cul-de-sac road, Meriwether Place, is the lone street within this community, and lush greenbelts buffer the entire perimeter of its acreage. The homes for sale at Phillippi Pines are the newest in its locality, with its listings typically constructed between 2013 and 2016. In comparison, most of the houses in its neighboring community, Old Forest Lakes, were constructed in the late 1950s and early 1960s. Most of the homes in Phillippi Pines are notably pool homes. The community’s residences are spacious in their layouts, with their floor areas measuring between 2,290 and 2,720 square feet designed with three bedrooms with at least two baths. Pricing of these homes are in the $600s‒$700s range. 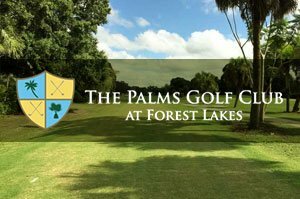 A revived golf course, the Palms Golf Club at Forest Lakes on Beneva Road north of Phillippi Pines, contributes to the market appeal of the community’s residences. Reopened after a major makeover in 2016, this golf club offers membership at very affordable rates. Its amenities besides golfing, include a newly built clubhouse with a bar and restaurant amongst other facilities. An older golf course, the Village Green Golf Club, is likewise just a short distance west of Phillippi Pines. Established during the 1960s, this local golfing destination within the northwest quadrant of Bee Ridge and South Lockwood Ridge Road offers reasonable membership rates, too, and provides many perks for its members, including a bar and grill. Besides these nearby golf clubs contributing to home values in and around Sarasota Springs, this area is also rich in other amenities. The stretch of Bee Ridge Road from U.S. 41 westward to the interstate highway is lined with many commercial hubs including a Walmart plus the Palm Plaza Shopping Center. Nearby schools, such as Sarasota High and Wilkinson Elementary, are likewise strong lures on listings of Phillippi Pines homes for sale, particularly to young families. At the southwest junction of Bee Ridge Road and Honore Avenue, the nature trails, playgrounds and facilities of Urfer Family Park add to the marketability of these residences. With all the vital road corridors around it, Phillippi Pines is likewise convenient to other major points of interest in Sarasota, such as the Siesta Public Beach just a 15-minute drive west from this community. Below are the current real estate listings available at Phillippi Pines.